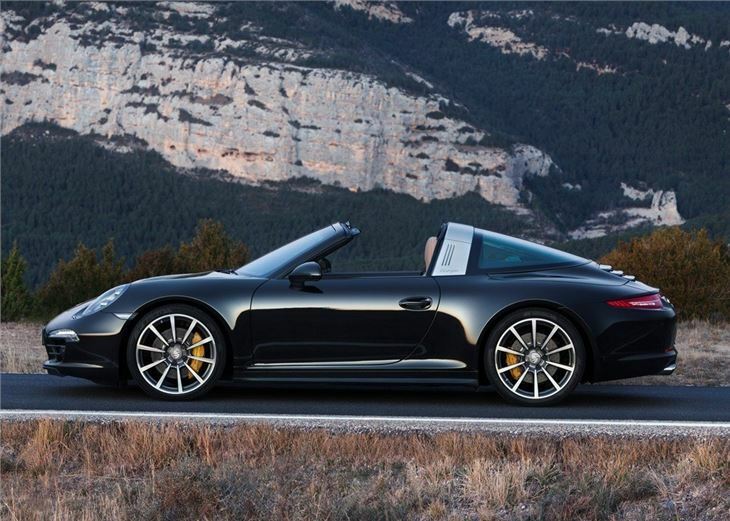 The Porsche 911 Targa is back and, for the first time in 20 years, it has a proper Targa roof. Inspired by the 1965 original, Porsche has returned to its roots and created a sports car that’s almost as stylish and distinctive as the first 911 Targa. Key to the new design is the fixed, aluminium rollover bar, which along with the wraparound rear screen, echoes the 911 that shook the 1965 Frankfurt Motor Show. 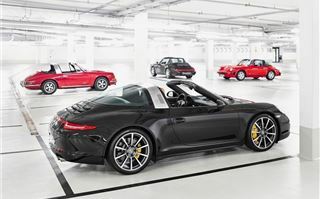 The return to the traditional Targa roof style is a huge improvement over the previous generation model, which had a large sunroof and little else to tell it apart from the standard coupe. The new Porsche also gets a more distinctive coupe shape, with sleek lines and wide four-wheel drive bodyshell. The 911 Targa is available in two forms, Targa 4 and Targa 4S, with both getting a leather interior, sports seats, dual zone automatic climate control and xenon headlights. An electronic folding roof is also standard, which will pack the fabric roof away under the rear screen. 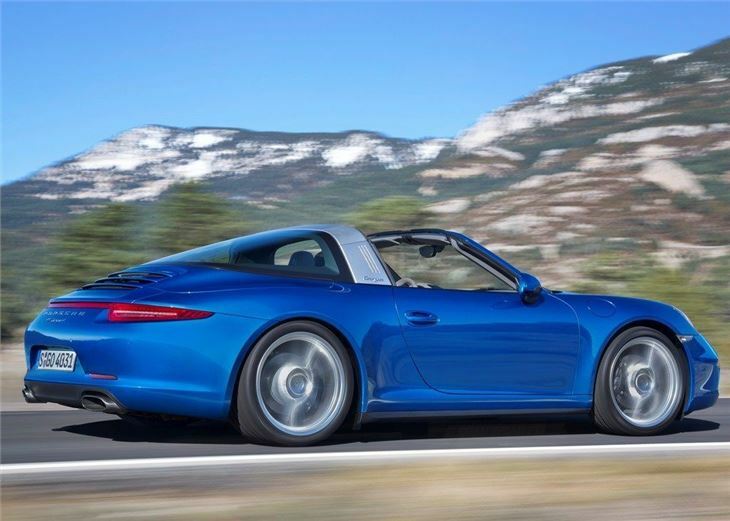 Limited to four-wheel drive, the Targa gets prominent wheel arches, which extend 22mm more than the rear-wheel drive 911, while the wheels themselves vary from 19-inch for the Targa 4 and 20-inch for the Targa 4S. The engine choices are limited to two naturally aspirated flat six engines, a 3.4-litre with 350PS in the Targa 4 and a 3.8-litre with 400PS in the Targa 4S. The transmission is a seven speed manual as standard, but the seven-speed PDK double-clutch automatic is available as an option, along with the performance enhancing Sport Chrono Package, which shortens the gear shifts and adds launch control. 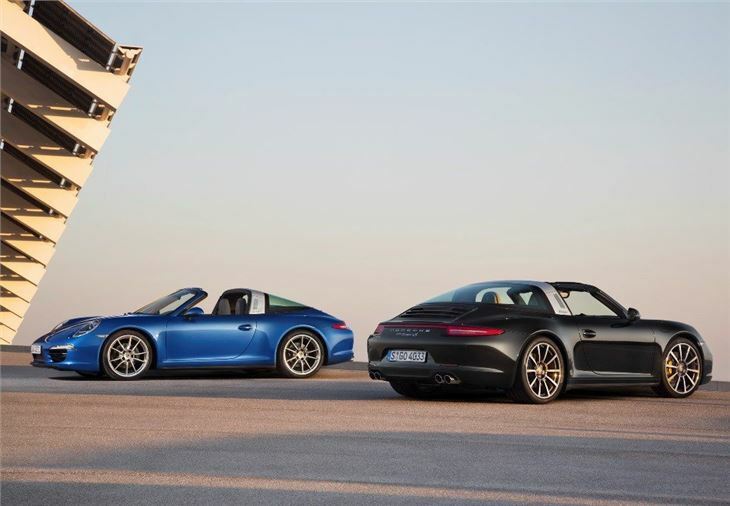 Both engines are quick and the Targa 4 will cover 0-62mph in 5.2 seconds and carry on to a top speed of 173mph, while the addition of the PDK and Sport Chrono lowers the sprint time to 4.8 seconds. For the 4S, the base performance is 4.8 seconds, but with the options fitted, the 0-62mph sprint takes 4.6 seconds while top speed remains unchanged at 183mph. The 4S also gets torque vectoring as standard, with a rear differential to improve traction and cornering. 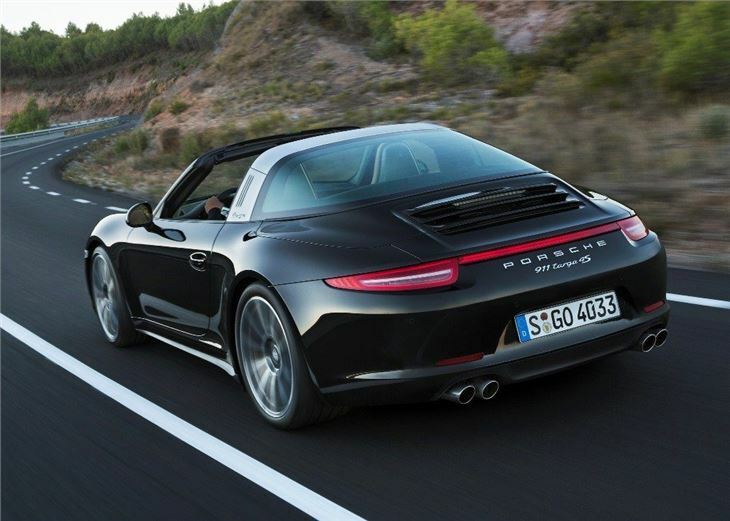 On the road the Targa feels very much like your standard 911, with smooth power delivery, predictable handling and mountains of torque. The electro-mechanical power steering system is excellent, with precise controls and good weighting. As a result, you can glide through corners with minimal effort, while the excellent four-wheel drive set up provides plenty of grip in the corners. The PDK automatic and Sport Chrono pack improve the driving experience, with sharper gear changes and launch control. Both of the engines are vocal and there's real enjoyment to be had with the roof down, as the flat six engine rasps along. Like the standard 911, the Targa comes alive in the higher rev bands - above 5000rpm - and the driver gets a superb cacophony of noise when putting the Targa to task. Porsche tell us the electronic roof makes the Targa 40kg heavier than the cabrio and 110kg more than a comparable coupe. The springs have also been softened and we admit that this does make the Targa a little sluggish in the corners and a tad stodgy when launched off the line, compared to the coupe. That's not to say it's slow, but a like-for-like comparison shows it to be half a step behind its hardtop brother. We also found some issues with the folding roof, which feels cumbersome and slow compared to rivals. Indeed, the roof can only be operated when stationary and the process takes 19 seconds, with the roof emitting a worrying creak as it waddles into the boot. However, it's solid enough when fixed into position and has excellent sound proofing, which means the 911 Targa is pleasant enough to drive along a motorway in the rain. 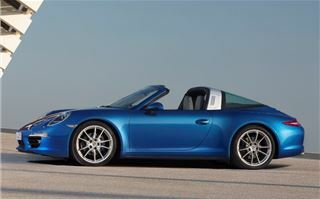 The 911 Targa isn’t cheap though, with prices starting at £86,000 for the 4 and £96,000 for the 4S. Add some toys – PDK and Sport Chrono – and you’ll be closer to £90,000 for the 4, while the 4S will be within touching distance of £100,000. That means the Targa is around £1000 cheaper than the Carrera 4 Cabriolet. With so little between them, it could be argued that it makes more sense to buy the full fat convertible, rather than the halfway house of the Targa, but we disagree. 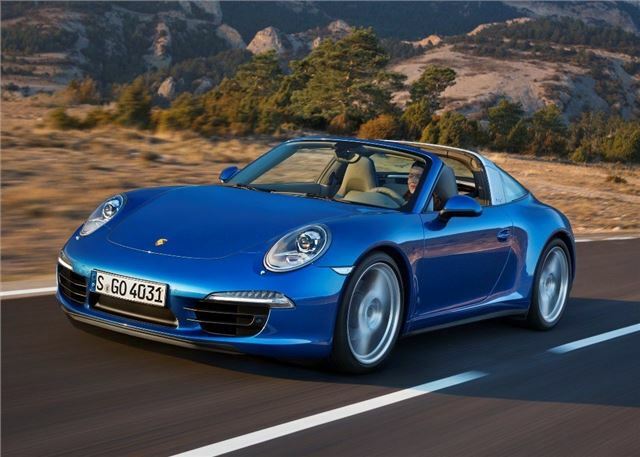 Despite some minor criticisms, the 911 Targa beats the cabrio on every level. Not only is it one of the best looking 911s you can buy, but it is also one of the most comfortable, with the roof down or up. We also think the Targa would be easier to live with on a daily basis, with a usable set of rear seats, decent claimed economy - 29-32mpg - and retro looks that will turn heads wherever you go. However, if you want a harder, sharper 911 experience, the Targa will not be for you. But if you want a sports car with GT overtures and a decent turn of pace, this 911 Targa will tick all of the boxes.